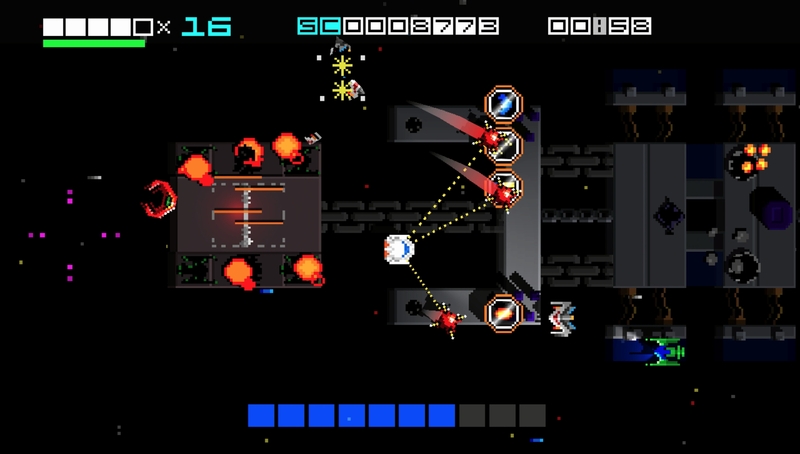 Normally I’m not a huge fan of bullet hell shoot ’em ups. I’m not sure why though. It could be the chaotic nature that the sub-genre brings with it. It could be the general linearity of them. Of course there are exceptions to the rule. Hyper Sentinel is one of those exceptions. I got the chance to have a hands on at EGX 2017 and I thoroughly enjoyed my time with the game. There’s little doubting that the game is a throwback to a bygone era. Lovingly created pixel graphics with fantastic animations. Audio that you could swear came from straight from an arcade machine or the SNES. Of course the visuals and audio are polished to modern standards, but there’s an attention to detail that adds an air of authenticity to the game. Even better is that the game uses modern hardware to its best and hits a minimum of 60 FPS on all devices. Developed by Jonathan Port, the single man team that makes up Four5Six Pixel and published by Huey Games, there’s more than the game that acts as a link to the past. Huey Games is a publisher led by Rob Hewson, his father Andrew Hewson and John Ogden. Andrew Hewson can be known as the founder of Hewson Consultants, publishers of titles like Avalon, Stormlord and Onslaught, which was re-released for iOS and the Xbox 360 two decades later. But what of the gameplay? This is where Hyper Sentinel really caught my interest. Most shmups have you on a single plain, going forward until you hit the boss. Here, it’s different. There are twelve levels, each an arena style area based on a ship you have to destroy. Each level progresses in the same sort of way. You destroy the ground (stationary) targets and once these are destroyed, you fight the boss. Also, you’re constantly getting harassed by enemy fighters. So far, so familiar. Its how the game plays that really stands out. Each level gets progressively harder as you go forward, each bringing in their own unique bosses. 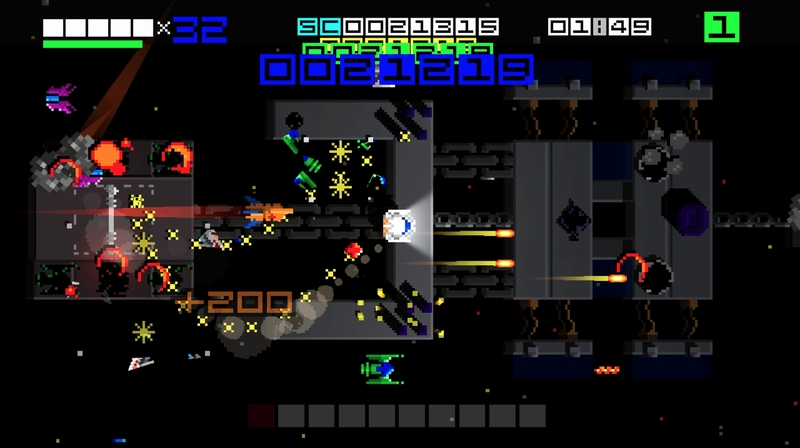 Indeed, in later levels some regular enemies are very similar to earlier bosses. 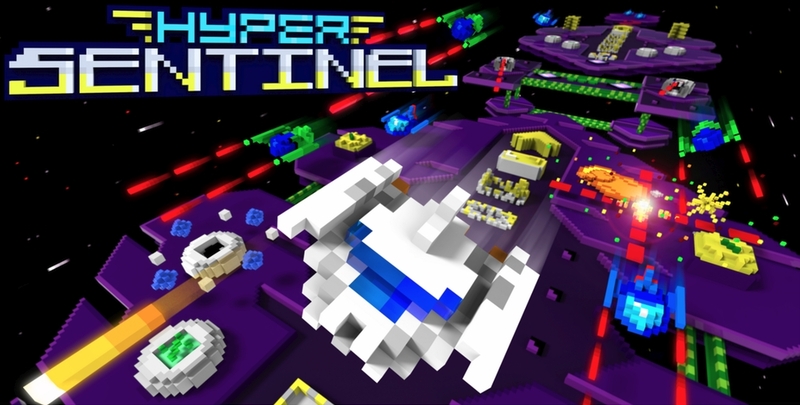 Hyper Sentinel also takes advantage of the arena based levels lets you move from side to side and make the most of the map. Working with this are a range of unique weapons and abilities that you can use throughout. Possibly my favourite weapon was the twin laser beams. They shredded through the enemy and played well to my usual tactic of blindly rushing, constantly firing and hoping for the best. 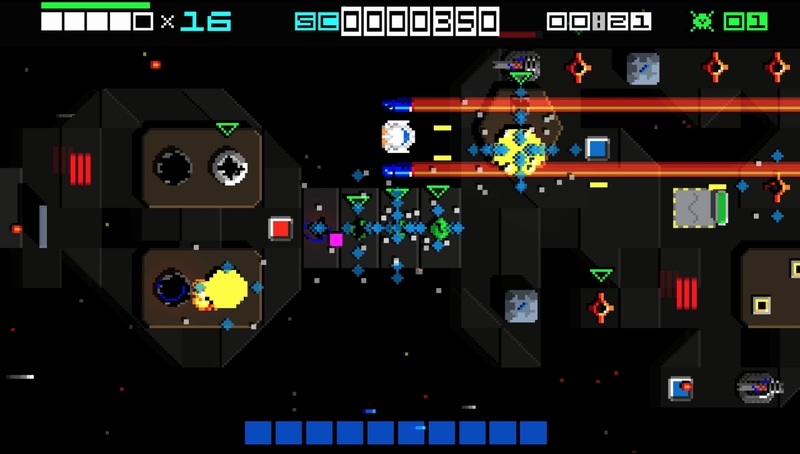 Other pickups granted abilities like a few maces that flew around your ship, smashing apart enemies, shields and of course boosts to your score multiplier. Your ship also has regular abilities that don’t come from collectibles. Taking from modern games is auto-healing that kicks in after long enough without taking damage. In addition to this are boosters which dramatically increase your speed, letting you catch up to some of those pesky pickups that race away from you. It’s in moving that one of the more interesting features of Hyper Sentinel come in, dodging. When you flip to change direction, which looks great, you’re made temporarily invulnerable. This is incredibly useful when low on energy and looking to auto-regenerate. Of course some of these aren’t available throughout the game. In the twelve stage campaign you’re perfectly fine to make use of everything. However, in Horde mode, which simply throws an increasing number of enemies your way, there’s no auto-healing. Your only way to recover is through pickups and you simply have to survive as long as you can. Boss Run is the other mode, which is fairly self-explanatory. You simply go through the levels facing boss after boss. I enjoyed my time with Hyper Sentinel and playing it on the Nintendo Switch was incredibly easy to do. Indeed, in the time I was playing it, I got through about four of the twelve levels before having a go on horde mode. This was the most fun I had, literally managing to last at least two minutes longer than I should as I got shield after shield pickup which managed to keep me alive with next to no health.